The castle sits atop a great rocky cliff. The only way inside is to traverse a long bridge, guarded by gargoyles all along the way. The master of this castle is a beast and chilling evidence of his flaring temper can be seen inside. Still, the sign out front says “Be Our Guest.” The mystery of it beckons, so you step one foot in front of the other, taking in the glistening woods of a French land nearly forgotten, all the while listening for the howl of the wolves you know must be lurking. Upon entering the castle you are faced with elegance and beauty that could only have come at the hands of royal designers! This is where I decided to spend my birthday. I was a guest of the beast, and here is my story. 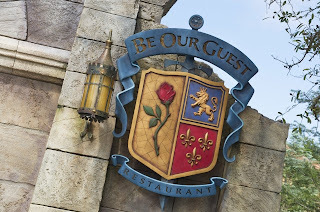 For the last few years, word of the new Be Our Guest Restaurant has piqued my curiosity. I carefully studied the Artist renderings as if they were works of Monet and I was an aspiring painter. I knew the menu before the doors opened and, most importantly, I knew the date reservations would begin being accepted. I wanted to celebrate my birthday there. Our reservation time was 8:10. This is important because Wishes was scheduled for 8pm this evening. We checked in shortly before 8, received our pager and waited on the bridge…the one with the gargoyles. The music began and what proceeded was an experience very unique to this particular spot. Situated directly in between Cinderella’s and Beast’s castles, it became a magical “dueling” fireworks show. 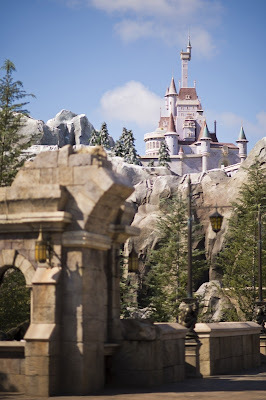 Many would shoot off in view of Beast’s Castle; others surrounded Cinderella’s. It enclosed us in glittering glory! For the record, yes- you can even see Tinkerbell fly from this spot! The fireworks ended at 8:12 and our pager went off at 8:13. Perfect. Upon entering the castle, you will feel as if you have entered Beauty and the Beast via a movie screen. The entrance, the ballroom, will all take your breath away! The chandeliers are magnificent! The cherubs on the ceiling…wait, those cherubs have a curious quality about them! Look carefully at their faces, you may just see an imagineer you recognize! The windows out back show a cobalt night sky and gently falling snow. It beckons you to sit and make yourself comfortable…much like Belle’s father must have felt after getting lost in the woods! Good ol’ Maurice, he was the beast’s first guest. Lucky for us, Beast has improved his hospitality skills since then! The Host who welcomed us was personable and gracious, offering us tips and advice. Our server, Chris (aka Skippy) was equally gracious and fun, making us laugh, including us on some “secrets” and even joining us at our table at the end of the evening. We could not have asked for better attention. Having a server who clearly loves his job is a bonus I sincerely appreciate! Of course, you really want to know about the food. It was delicious. Yep, everything we had, from soups to fish to potatoes to veggies to steak was delicious. The wine pairings were excellent. Hold up! Wait…wine in Magic Kingdom? Is that allowed? Is it breaking some moral code? Well….I don’t know. Did I drink wine? It was a celebration indeed! Oh my gosh, I so enjoyed this post and am looking forward to having dinner there in August. I can't wait to look for all the Imagineering tidbits everywhere. It will blow you away, Jackie! Thanks for reading and sharing! I'll have to share this with my sister- her family is visiting later this year, and my niece was just diagnosed w/ celiac. She'll be so glad to hear about being able to eat at BoG! 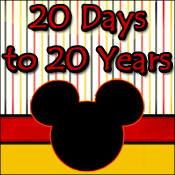 K Jay, your niece will be in a Celiac's heaven in WDW! The chefs are so attentive and take will take her health VERY seriously! Every restaurant, even quick service, will have options for her. Check back soon! I am planning a full write up on some of the gluten free options Disney has to offer!